After a two-day launch delay, Progress MS-08, an autonomous Russian cargo spacecraft, is on its way to the International Space Station. Liftoff took place atop a Soyuz 2.1a rocket occurred at 3:13 a.m. EST (08:13 GMT) Feb. 13, 2018, from launch pad 31 from the Baikonur Cosmodrome in Kazakhstan. The spacecraft is carrying some 3,060 pounds (1,390 kilograms) of dry cargo,1,960 lbs (890 kilograms) fuel, and 926 lbs (420 kilograms) of water, as well as 100 lbs (46 kilograms) of oxygen to the outpost. 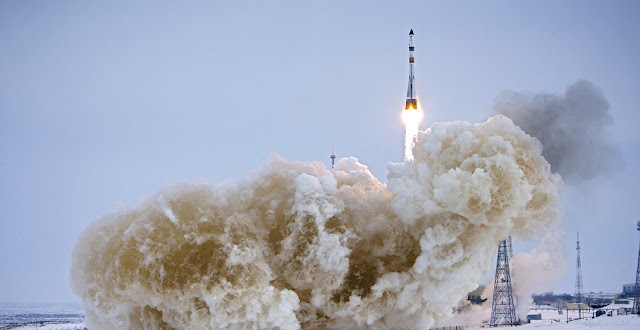 Progress MS-08 was launched by the 151-foot (46.1-meter) tall, 9.68-foot (2.95-meter) wide Soyuz 2.1a rocket. The medium-lift booster has the capacity to send 7.8 metric tons to low-Earth orbit. Soyuz 2.1a sports four liquid-fueled strap-on boosters each with a single RD-107A engine. They surround the 91.2-foot (27.8-meter) tall core stage, which is powered by an RD-108A engine. A 22.11-foot (6.74-meter) tall upper stage, powered by an RD-0110 engine, finished the job of placing Progress MS-08 into orbit less than nine minutes after leaving Kazakhstan.